The younger brother of Habsburg emperor Francis (and the older brother of Archduke John), Charles was the most respected Austrian Army commander of the early to mid-Napoleonic period, and one of the rare, capable military leaders to emerge from the Austrian imperial house. During the first decade of the nineteenth century he was also an important military reformer, and a political influence for moderation among the bellicose court factions of Vienna, but his relatively brief career was hampered by physical frailty, enigmatic temperament, and the emperor's failure to give him consistent support. Brought up in the Duke of Saxe-Teschen's household, Charles did not arrive in Vienna until 1790, and only entered the Austrian Army in 1792, when he saw his first action at Jemapees. Given a corps command for Saxe-Coburg's 1793-4 campaign in Flanders, he fought at Maastricht in February 1793 and played a vital role in the victory at Neerwinden in March. Charles led his corps at Landrecies the following spring, and emerged with more credit than most from the defeat at Fleurus. Already displaying characteristic organizational qualities, attention to detail and tactical awareness, as well as the compulsive caution that often restricted his successes, Charles retired at the end of 1794 to devote his time to military writings, but replaced Clairfait in overall command of Austrian forces at the Rhine in early 1796. Though forced back to the Danube by French attacks in the summer, he made his name with an autumn counter-offensive, winning victories over Jourdan at Amberg and Würzburg before narrowly missing a chance to trap Moreau at Schliengen in October. Following Bonaparte's victories in Italy, Charles was given command of the Austrian army in the Alps. However, he was unable to get the better of the young French commander, and merely succeeded in limiting the destruction and losses. He was nevertheless forced to sign the Loeben armistice. 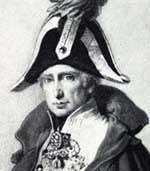 Charles took 30,000 troops to Italy in early February 1797, and encountered Napoleon for the first time during the Frioul campaign a few weeks later. His escape with an almost intact army confirmed his status as the one senior Austrian general to emerge from the War of the First Coalition with credit. Following the Treaty of Campo-Formio, he was named Governor of Bohemia, where he had inherited the duchy of Teschen. He accepted command of Austrian field forces in February 1798, but his position was undermined by exclusion from Alvintzi's royal commission for army reform, and his opposition to participation in the Second Coalition was overruled by a court war party centred on the empress. Though he considered his army unready for war, Charles halted a French offensive across the Rhine at Ostrach and Stockach in spring 1799, before transferring his main strength south to drive Masséna back beyond Zurich on the Swiss front. Unable to break through Masséna's mountain positions during the summer, he returned to the Rhine for the autumn in line with Vienna's altered strategic priorities, but remained static while Austrian positions collapsed elsewhere. Pleading ill-health but really in disagreement with the decision-making in Vienna, he resigned his command to Kray in March 1800, escaping the odium of subsequent Austrian defeats, and returned to Bohemia where he organised a corps of 25,000 volunteers. Following the defeat at Hohenlinden, where his brother Archduke John had commanded the Austrians, he resumed his service. However, unable to present Moreau's advance, he was forced to sign the Steyr armistice on 25 December, 1800, thus preventing the French from reaching Vienna. His reputation intact, Charles was appointed war minister in early 1801 and given wide-ranging powers of reform. The war council was however conservative, slow to react, and ridden with internal squabblings and hostility between the military and civilian authorities. Charles quickly realised that Bonaparte was for more dangerous than any Jacobin, and set about trying to prepare Austria for the coming conflicts. He, along with Archduke John, Josef Hormayr, and Frederick von Gentz, formed the pro-war party in Austria and considered the peace treaties made previously nothing more than temporary truces. In 1802, he abolished military service for life, introduced conscription (which included exemptions and replacements), and in 1805 also abolished corporal punishment. Committed to the basically defensive military orthodoxies of his predecessors, and guided by administrative protégé Fassbender, Charles set in motion long-term organizational changes that achieved little of tangible value before 1805, but left the army's outdated tactical methods alone. Gloomily aware of its continuing combat weakness, he made vain efforts to dissuade Francis from joining the Third Coalition in 1805, and was relegated to the secondary command in Italy, where he won a minor victory at Caldiero. Charles also introduced reforms to develop the infantry, an arm of the Austrian imperial army that had previously been neglected in favour of the cavalry, and created reserve regiments as well as a territorial army, known as the Landwehr, which his brother John had also developed in the Tyrol region. A problem that Charles faced was the need to create a national unity that could stand up to the French revolutionary ethos. The Austrian Emperor was however reluctant to such a policy, and while Charles continued to create military schools, archive centres and military parades, all with the intention of improving the military understanding of the Austrian officers, his reforms never fully came to fruition. Despite having created a far more mobile army, and given overall strategic control of the Austrian Army for the first time, he nevertheless regarded the 1809 campaign as premature. It was during this series of conflicts that Charles was to reveal both his strengths and his weaknesses. Indecisive in the planning stage, and pessimistically concerned to preserve his army throughout, he displayed a tactical nimbleness that reduced the impact of defeats at Abensberg and Eckmühl, and almost beat Napoleon at Aspern-Essling in May. Apparently on the verge of ending Napoleon's career, Charles was however unable to profit from his success at Aspern-Essling. Transformed from hero to scapegoat by his crushing defeat at Wagram in July, and his subsequent surrender at Znaim, he resigned his command a few days later, and never again held an important military command. The pro-war party, including Francis, still hoped to continue the war in Hungary, where they still maintained a substantial army. However, Metternich and his pro-appeasement party won over and Francis was forced to sign the Peace of Schönbrunn. Shunned by the emperor and most senior officers, Charles was ignored throughout the campaigns of 1813-15, apart from a brief spell as commandant at Mainz during the Hundred Days. He spent the rest of his life in retirement, refusing a military appointment even after the death of Francis in 1835, and restoration of his reputation began only during the 1860s. Charles died in Vienna in 1847, aged 76.